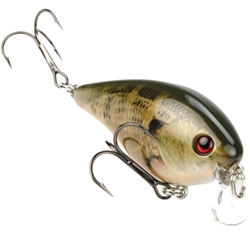 The Strike King KVD 1.5 Shallow Runner has the same body style as the KVD 1.5 Square Bill and great erratic yet true running action and deflection off cover but it runs shallower. This 1.5 has a unique action that constantly "wanders" with erratic action while still running true. Beautiful chip-resistant finishes, 3D "look alive" eyes, along with the design of no internal rattles for a "silent" approach makes the deadly combination of the 1.5 Shallow Runner. Dives to 3 foot.